There was a staff presentation of the Capital Budget and Plan followed by extensive discussion by the Board. The sheer scale of the $33.5 billion plan (discussed in a previous pair of articles here and here) brought wide-eyed reactions, but a consensus that the plan was long overdue. The TTC and its funding “partners” really need to appreciate the amount of money needed to continue owning and improving the existing system, let alone building any extensions. The presentation is a condensed version of the “Making Headway” report. 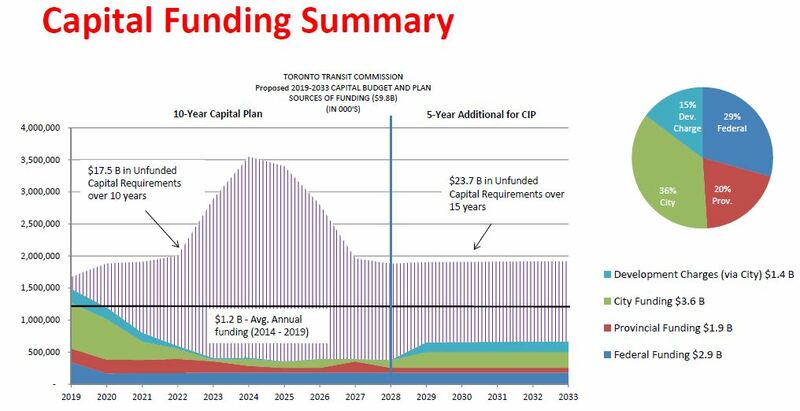 A few charts within it make a brave attempt at saying the TTC’s needs are not quite as bad as they may seem by comparison with historic spending patterns and with the overall provincial and national spending. 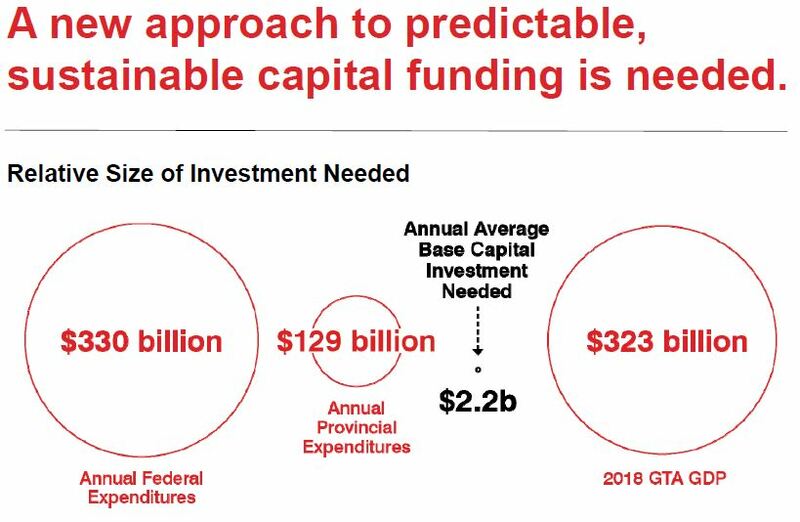 The chart below is similar to one in the main report, but it includes a line at $1.2 billion which is the average funding level from 2014 to 2019. The implication is that because money has always been found in the past for this level of spending, this will continue and the dip from 2019 to 2023 will not be as severe. This ignores the reason for the decline in the City’s planned contribution (green slice of the chart) arising from exhaustion of the self-imposed debt limit in coming years. All of the headroom has been consumed by planned borrowing for the Gardiner East rebuild and the Scarborough Subway Extension. Without question $2.2 billion per year is small compared to other financial streams, but there are two obvious problems. First, the call for provincial and federal funding will compete with major expansion projects such as the Relief Line, not to mention the constantly shifting political winds at both levels. Second, the spending does not conveniently run at a flat level over 15 years, but peaks at $3.5 billion in the mid-2020s. Even if this level of sustained funding were provided, a bridging strategy will be needed to get past that peak. Furthermore, there are project dependencies that have not been fully explored, and there is a good chance that some spending now shown in the “out years” beyond 2028 will in fact be needed sooner. The ten year Capital Plan from 2019 to 2028 includes a small amount of money for design work on the Scarborough Extension, the Relief Line South and Waterfront transit. However, there is no funding for actual construction. As previously announced, about $325 million worth of property acquisition and utility work for the Relief Line will be moved forward into 2019-2020 with half being funded by the City. The other half depends on contributions from other governments who have yet to commit to this. I will address other issues with the Capital Plan including project timing, scope creep and operating budget effects in a future article. Although there is a “Fair Pass” program, the cost of a pass is equivalent to more fares than many riders would require in a month, and the discount is of no value to them. The percentage increase in student and senior fares is higher than for adults. Adults go from $3.00 to $3.10 (3.3%) while seniors/students go from $2.05 to $2.15 (4.9%). Similarly, passes go up proportionately more for the concession fare classes than for adults. As I pointed out in an earlier article, there is no benefit to the Fair Pass program for students and seniors because the “discount” simply brings the fare down to the student/senior rate they are already paying. There also remains the question of whether the City will fund the expanded eligibility for phases 2 and 3 of this program. The staff presentation included some information that was not part of the original report. During the course of debate, the question arose of whether City staff were prepared to support a request for $22 million in additional subsidy when the guideline issued by the City Manager had been that all departments and agencies flatline their spending. TTC CFO Dan Wright replied that that the City would accept 3% but no more. Until the City’s own budget launch on January 28, we will not know whether this amount has actually been included. In spite of regular calls at the City for zero increases in budgets, over the years there has actually been a consistent increase in the dollars the TTC receives. The $22 million “ask” for 2019 is actually smaller than the change in any year back to 2014. Of course in the wider City budget context, any extra money the TTC does get might come out of budgets in other programs and agencies. This triggers the inevitable challenge to transit boosters of “where would you cut”. That is the wrong question, but the debate is constrained by preconditions on the level of property tax increases. The presentation rattled off the now-familiar list of improvements, initiatives and achievements, some of which have been in place for a few years. Sadly, the charts from the CEO’s report on January 12 in which “achievements” in service delivery were trumpeted are duplicated here. These include a substantial understatement of the service actually provided in fall 2017 on the streetcar network against which staff claims to provide 56 more streetcars/buses in 2018. They simply neglected to count the buses operating in 2017. There is an ongoing problem with counting passengers and the TTC’s “ridership” has been falling. 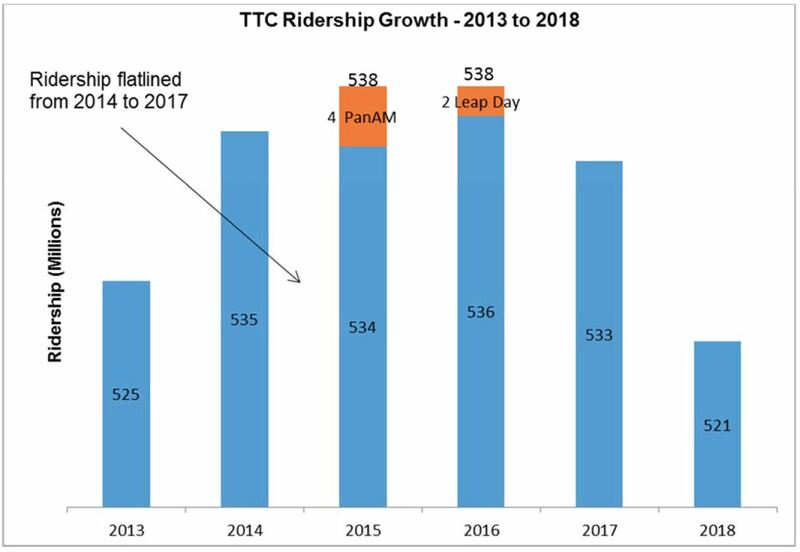 The underlying issue is that over half of all TTC trips are taken using a pass of some kind, and sales of these are converted to “rides” using multipliers that are adjusted from time to time. It is quite possible that past ridership has been overstated, and the current “fall” is a result of the calculation used to convert passes to rides, not an actual loss of riders. 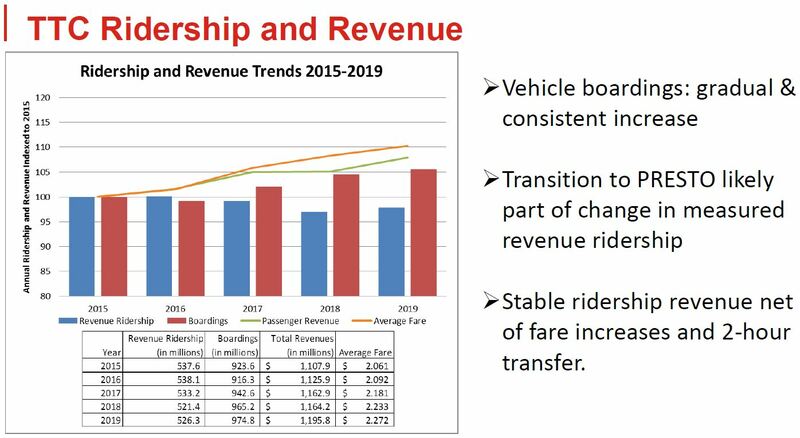 Although “ridership” has been flat, “boardings” are going up. A “boarding” is one passenger getting on one vehicle, and so there will be multiple boardings for any “ride” that involves transfers. Boardings are going up even though ridership is not. The average fare is also rising as riders switch from flat rate passes to pay-as-you-go on Presto, and passenger revenue is also climbing. In the chart below, the raw numbers are normalized to a scale of 2015=100 to show the relative level of the changes in each value. 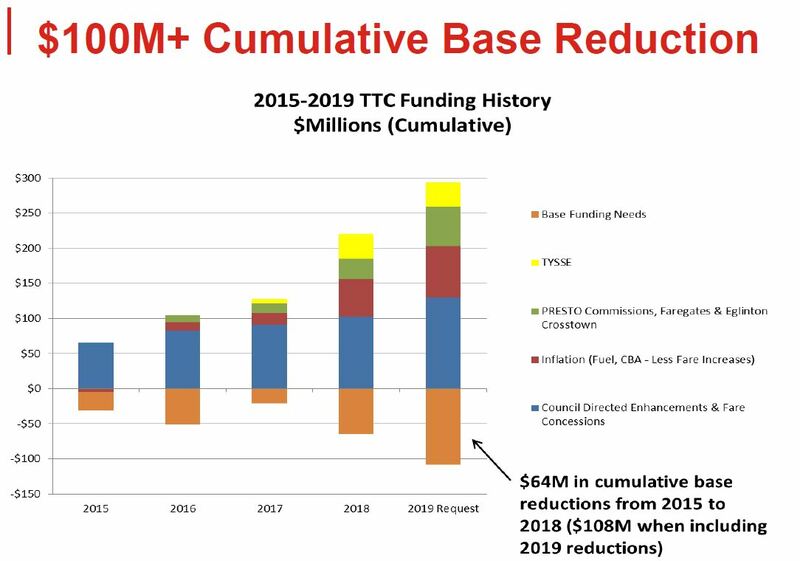 The chart below shows the relative size of cost reductions made by TTC management from 2015-2019 and the added costs the system has absorbed over the same period. The lion’s share of the additions (blue) come from Council-mandated policies including service improvements and fare reductions. A smaller slice (red) comes from inflation and collective bargaining agreements (CBAs). Next is the rise in Presto fees (green) as riders shift to that mode of payment. There is no tracking of offsetting savings, if any, from winding down the legacy fare system. Finally, there is the cost of the Vaughan subway (TYSSE, yellow) which has added to the total funding requirement without generating offsetting revenue. TTC staff plan to bring a report to Board late in 2019 with a multi-year service and fare plan. This will include a discussion of the fare schemes Presto can (or might) support. Frankly, this is a report that should have been part of the new Board’s “welcome package”, but inevitably in election years this type of work simply stops. Any new scheme will inevitably bring costs over and above those flagged in the operating and capital budget projections. TTC service has been plagued with problems due to the cold weather and other infrastructure issues. Situations that individually might have been merely annoying compounded to make the system unusable for many would-be riders, and extremely uncomfortable for those who actually managed to get on. Whenever the weather turns bad, demand on the TTC goes up as those who normally drive and cycle switch to “the better way”. However, the system, even without basic reliability problems, has almost no spare capacity. Crowded trains often trigger medical issues with riders, and these can bring additional delays even if the stations are not badly crowded. Less service than normal and a hugs backlog of riders on platforms compound the problem. Cold weather plays havoc with the old streetcars, a problem we have seen in previous winters. When the deep freeze hit, all of the remaining CLRVs and ALRVs (the old fleet) were taken off of the road and service was provided by the new Flexitys. However, there are not enough of these cars to field service on all lines, and the two routes, 501 Queen and 506 Carlton, that still depend on the old fleet were severely affected. There are about 120 of the new cars (allowing for deliveries in progress and cars out for major repairs), and the TTC managed to field about 100 new cars. Service was extremely erratic on the affected routes. Buses were used in some cases to supplement service, but the TTC is not flush with spare vehicles. Emergency track work was underway between Union and King Stations (see below) before the cold weather hit, and it was supposed to be completed. However, with the cold, the TTC crews were dispatched to deal with problems elsewhere. Because the track is unsafe for normal operation, there is a slow order which causes service on the University side of Line 1 to backlog to Eglinton West or worse, and service is far less frequent than normal. This work is now scheduled to be completed on 3. A signal failure at Museum caused by a failed insulated joint required all service to be manually controlled through the affected section and operated at slow speed. When there is a “track down” condition (in effect a short circuit) on the signal rail, the system “fails safe” and assumes that there is a train present when the track is actually clear. Operating procedures under this condition are deliberately cumbersome to ensure that trains operate safely in the absence of a working signal system. This problem lasted from early in the AM peak through to about 10:20 am. Ironically, the area of the failure will convert to Automatic Train Control in a few months, and track circuits failures will no longer be a problem. An emergency alarm at Rosedale delayed service for a period after 9 am. Various “operational problems” (unspecified in the service eAlerts) caused delays on much of Line 2 Bloor-Danforth through the morning. There were other problems through the day on both major routes. This was quite literally a “prefect storm” of events not unlike the one that hit the TTC almost a year ago. The TTC has not announced whether they will produce a public “post mortem” of events together with plans to avoid or at least minimize this type of problem in the future. The curve from Union to King northbound is the second tightest on the system as riders who endure wheel squeal when the lubricators fail know only too well. 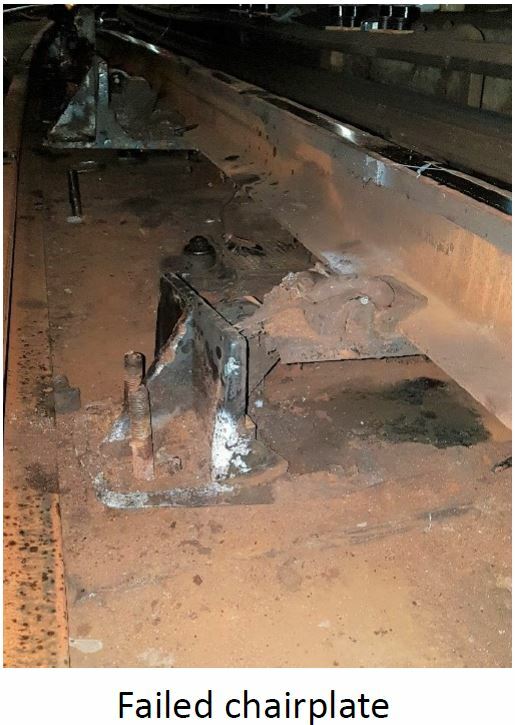 The rail was badly worn and due for replacement, a job which would normally occur without affecting service except, possibly, for extended shutdown hours to allow work to be completed. However, once the project was underway, the complexity of repairs that were required became evident. Railway cars go around corners because of the force bearing on wheel flanges from the track. The diagram above shows the typical installation on a curve. 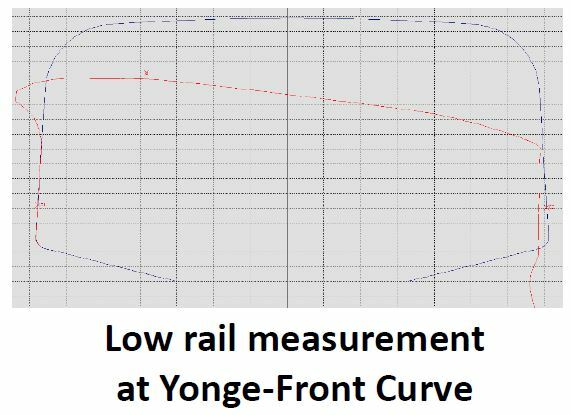 If this were a very gentle curve, there would probably be no superelevation, and the flanges bearing on the outside rail of the curve would be able to guide a train. However, this does not work for tighter curves and the force to guide trains is applied in a different way. Although the flange on the “Low rail” above is on the wrong side to guide the train, there is a separate restraining rail mounted horizontally that presses on the wheel. That rail in turn is mounted on the chairplate as shown above. Finally, the whole trackbed is superelevated on the outside of the curve. Track on tight curves tends to wear out faster, and the low rail between Union and King had reached the point where replacement was required for safe operation. The difference between the standard rail profile and the track actually in service is shown below. Note how the track is not only worn, but deformed from its original shape. 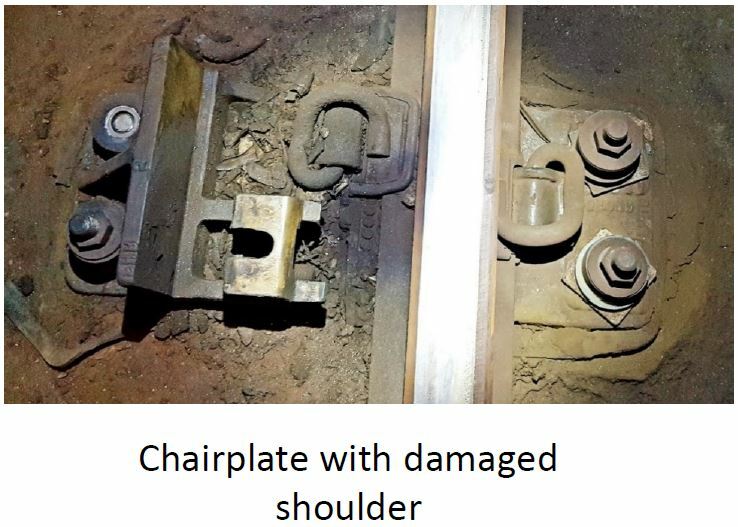 When the TTC began to remove the old rail, they discovered that many of the chairplates were damaged and, therefore, the restraining rail was not properly supported. A failure of this track would cause a derailment. The situation required the removal of the restraining rail and the replacement of all chairplates. 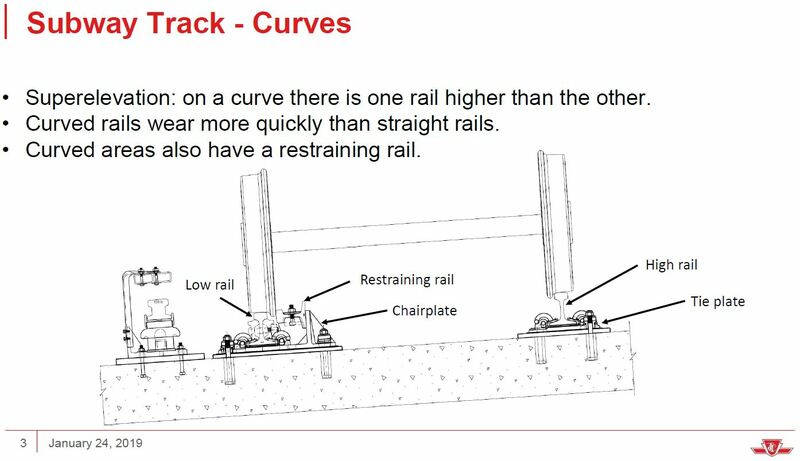 However, without a reliable restraining rail, trains could move around this tight curve only very slowly because the restraining rail was not able to guide them. 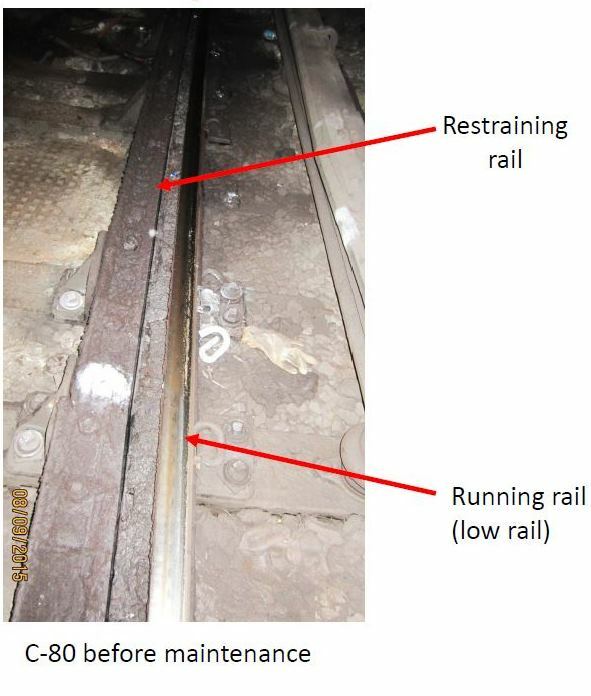 The photo below show the “before” condition with the existing running rail (clearly with bad wear) and the sideways facing restraining rail. The next photo shows the new running rail in place, new chairplates, and the restraining rail sitting to the left waiting for installation. Steve: Actually, it was not until they disassembled the running rail assembly that they could see that the chairplates under them had failed. However, this is obviously a case where they need to be able to inspect both. Do they use heat treated rails for the tight curves to reduce rail wear? Steve: I believe so, but that rail was really, really worn. The full presentation including samples of rail is in the Youtube video of the Board meeting. These “service disruptions” highlight the need for basic maintenance and SOGR on the system. Hopefully we do not need another Russell Hill to remind both the politicians and management of what underfunding leads to. The crappy weather only highlights the latent demand for transit in our city. While bad weather will only drive in the cyclists temporarily, drivers would use the system on a more regular basis if the service was reliably there. Obviously we need our streetcars (new 204) as soon as possible. Order the additional 60 to provide additional service capacity and spares. This will free up some bus capacity that can be used to handle a crisis like these past weeks. Occasionally we will continue to see beyond peak demand days whenever the weather gets very nasty and you can’t build the system for that load on a regular basis. But you can use those heavy load days to see where the bottle necks and problem areas are. A post mortem triage is critical to see where improvements can be made. More could be done to pre-disaster our transit system. The core of the TTC currently is lines 1 & 2 – the backbones of the system. If service is disrupted on one of these lines, the rest of the system goes into shock mode. The TTC has plans they set in place during a weekend maintenance line shutdown, could they be updated for use on “disaster days”? With the opening of the Crosstown there will be a northern alternative that can be connected for disruption on Line 2. Line 2 also has Streetcar links at Dundas West, Broadview and Main to help alleviate the strain. The control center staff need to have plans that can react to any system failure. For example – instead of operating slowly around the Union-King curve Line 1 could have been broken and operated as two separate sections – Finch to King and Union to VMC. For the signal failure at Museum, stationing staff at St. George, Museum and Queen’s Park linked by phone or radio to the control center would provide visual positioning confirmation of trains and allow faster operation. I admit second guessing from hindsight is easy to do, but crisis planning, along with situational and “disaster day” post mortems can provide long term solutions for various “incidents” before they happen – allowing the TTC to provide a planed and measured response. Steve: The crossover at King is still not able to operate automatically. This will last until sometime late in 2019, or maybe early 2020, when the ATC project reaches this part of the line. When it has been used (and will be during an upcoming shutdown), it is operated manually and cannot sustain peak headways. A related issue for emergency turnbacks when there are power cuts is that the way the third rail feeds and breaks in power sections are set up does not allow use of a crossover if power is out on one side. For example, at King, the break in sections is at the crossover. If there is a problem at Dundas requiring a power cut, there is no power north of King crossover and trains cannot turn back there. New power gaps at the south end of King Station and one train length north of King crossover have to be added. This would allow power to be fed to the section on either side of the crossover independently of nearby stations. When Bloor crossover was electrified decades ago, this change was made (there is a gap at the south end of Bloor and another half way around the track between Bloor and Rosedale). A power gap was added west of Broadview Station so that trains could turn back there even if there is a power cut for work on the Prince Edward Viaduct. Without it, they could use the centre track east of Broadview, but the last service stop would have to be Chester which has no facilities for transferring riders to a bus shuttle, and Pape was actually used as the terminus during bridge maintenance. There were announcements on the Bloor-Danforth trains, basically saying that transit control was slowing or holding back downtown-bound trains because of overcrowding at Yonge (and at St. George?) due to all the problems on Yonge-University. An interesting article about the rails. You indicate that the curve from Union to King northbound is the second tightest in the system. Would the first tightest be Union to St. Andrew northbound? Thanks! Steve: It’s certainly among the tightest. North to east from Museum to Lower Bay is really tight too, but it has not seen regular service since 1966. It seems to me that King to Union southbound must be tighter than Union to King northbound, since it is on the inside of the curve. I’m guessing there are tighter curves in Greenwood Yard, especially around the back, but I could be wrong and in any case of course those aren’t used by in-service trains. Steve: This may be true, although given the wheel squeal on the west to north from Union to St. Andrew, it has always struck me as a very tight curve. This may also have something to do with the operating speed there. I suppose the easiest test is to ride TR trains around various curves and see just how far they bend! 1) Why are all the crossovers double? I understand why terminus and former terminus crossovers are double, but if it was built as an occasional turnback point, why would you use the facing point crossover? Can’t the trailing point crossover handle everything, and possibly be easier to signal because of less reverse-running? 2) When they used Broadview as terminus, did in-service trains simply take the third track to get to the south platform, and then proceed back east as usual, or use some other procedure? Steve: I think that the idea of a full double crossover would be to maintain something close to peak service. That said, operationally they tend to use only one platform for ease of passenger control during turnbacks even at Bloor which is already electrified. As you may know, the reason the double crossover at Union was converted to a single trailing format was that there was a derailment years ago on the facing switch on the south to west curve. The last time Broadview was a terminus, they used the westbound platform. This has the advantage that the elevator that goes all the way to the street in one lift is on that side. Trains operated eastbound through the centre track and thence to the eastbound platform at Chester. Scott Burgess asked: An interesting article about the rails. You indicate that the curve from Union to King northbound is the second tightest in the system. Would the first tightest be Union to St. Andrew northbound? Given that two parallel tracks are more or less concentric when going through a curve, it would make sense that the southbound track from King to Union has a tighter radius than the northbound track from Union to King. So, if the northbound track is the second tightest in the system, then that would make the southbound the most tightest. Everything else falls further down the list. With the platform arrangement significantly changed and trains using the pocket track west of Union to reverse, is there a reason to keep the single crossover now? Why not remove it altogether? At most stops I’ve observed, there’s a consistent effort to clear a 3-4 foot area near the “front” of a stop where the front door of a TTC vehicle would be but that’s it. Forget having any area cleared for any of the other doors. Go up to any random stop and the curb cuts have a pretty good chance of having a thick 2-3″ layer of congealed ice over it. On streets with buses that have to pull up to the sidewalk, not having a clear area for the rear doors is a clear safety issue. For the 100′ streetcars this creates a lot of problems for safety, crowding around the front, and obviously accessibility. I might catch some flak for saying this but the usual suspect accessibility advocates need to stop wasting everybody’s time and resources threatening to sue the city/TTC over audible readouts of Presto balances and worry about actual threats. In my first little rant I forgot to rant about the terrible conditions in the King pilot zone. It’s no better than anywhere else. The snow from the plows was piled into the TTC stop zones and passengers were left to cut their own paths through the snow and ice leaving openings which may or may not have lined up with the doors on the new streetcars or the 40′ diesels. The door with the ramp might be stopped in front of a pile of ice 3-4″ deep… but at least the temporary ramps down to street level were cleared and salted? Small victories. Another little thing maybe because of the snow plows the yellow caution strips marking the edge of the loading areas were ripped up and missing from large portions of many stops. Let’s see if these stay missing for a few months until the end of the pilot.